Women love roses no matter which form they are in.Dunno why a rose cheers a women and makes everything look lovely for the rest of the day.However bad a day can get, a bouquet of roses make you smile. 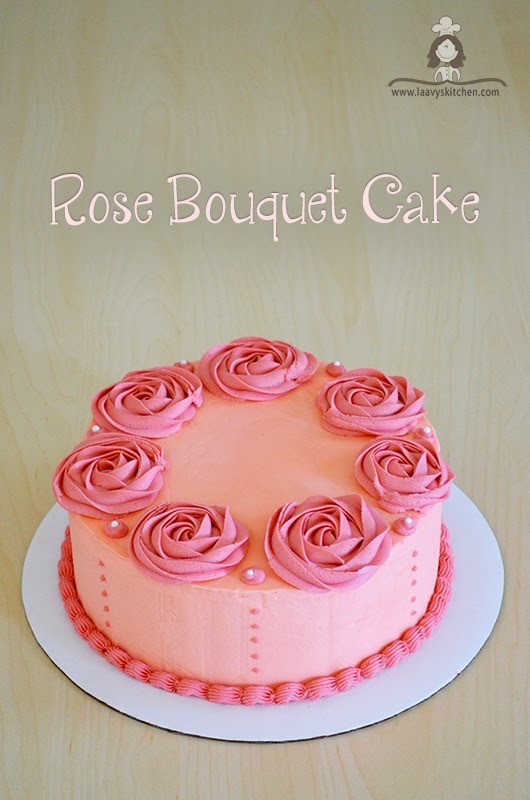 I made this Rose Bouquet Cake for a birthday party and everyone loved it.So thought of sharing a few pics here with everyone.This is a Chocolate layered cake with Vanilla butter cream frosting. I recently posted the recipe for the chocolate cake,which you can find it here. I have posted a few videos below - Piping the roses and shells.Hope it helps out !! This batter makes 2 separate cakes. Preheat the oven to 325 degree F or 162 degree C.
Grease the cake pan with butter and then add some flour and gently coat them.Keep them aside. Dry Ingredients - In a large bowl combine all purpose flour,cocoa powder, baking powder, baking soda,salt .Stir using a wire whisk until well combined and then sift through a mesh to avoid large pieces. In a large bowl add butter and using a hand mixer, cream the butter on medium speed for 30 sec.Add granulated sugar in small batches and beat until well combined.This takes about a minute. Add one egg at a time and beat for 20- 30 sec. Add the vanilla extract. Now add the dry ingredients and milk into the butter mixture in small batches in alternating ways.Beat using mixer for just 20-30 sec just until combined. Don't over-beat them for a long time.This makes your cake very dense. Add the flour,then add some milk,then add flour and so on...Finally add the Hershey's syrup.Give a gentle mix using mixer for 10 sec.That's it.Your batter is ready. Split the batter into two equal halves.If you have two cake pans,pour them and put them in the oven at the same time. If you don't have two cake pans ,just make one wait for it to cool down and then pour the second batch. Bake in the oven at 325 F for 25- 30 min.Keep your timer at 20 min.Check every 5 min until a toothpick inserted into the center of the cake comes out clean. This batter makes 2 separate cakes.While they are cooling,lets go ahead and make the frosting. In a large bowl add butter and using a hand mixer, cream the butter on medium speed for 30 sec.Add confectioners sugar in small batches and beat until well combined.This takes about a minute. Add the vanilla extract and milk.Then beat again until they are creamy. If it is too creamy then add more sugar.If it is too thick add some milk.Adjust until the you get the right consistency. Take a fresh toothpick and just take a little food coloring and spread it along the icing.Add coloring in little amount until you get a nice peachy color. After the cakes are cooled completely,its time to layer the cake. 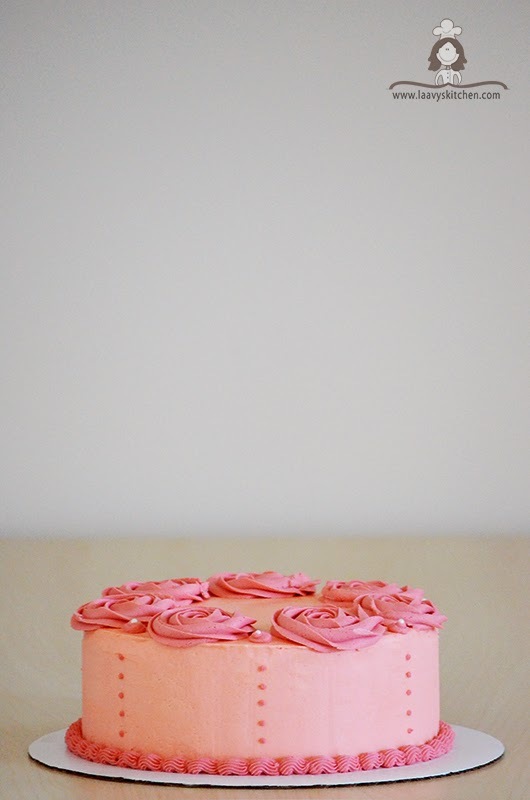 Place a tiny amount of frosting on the cake board.Place the first layer crumb side down so that the icing acts as a glue and your cake will not move.Scoop a small amount of Peachy Vanilla butter cream onto the top layer and spread it gently.Careful not to press it too hard. Apply the peach butter cream on sides and top of the cake.Take the icing scrapper and take off excess coating until you get a smooth finish on the sides and top of the cake.and This is how we crumb coat the cake.Place the cake in the refrigerator and let it get hard for about 30 min.Do not freeze. After 30 min take the cake out and apply the same peachy butter cream and spread it on all sides covering the entire cake.Take the icing scrapper again and take off excess coating until you get a smooth finish on the sides and top of the cake.This is the base coating.Let it refrigerate for an hour until the frosting sets. You cake is now ready to be decorated. 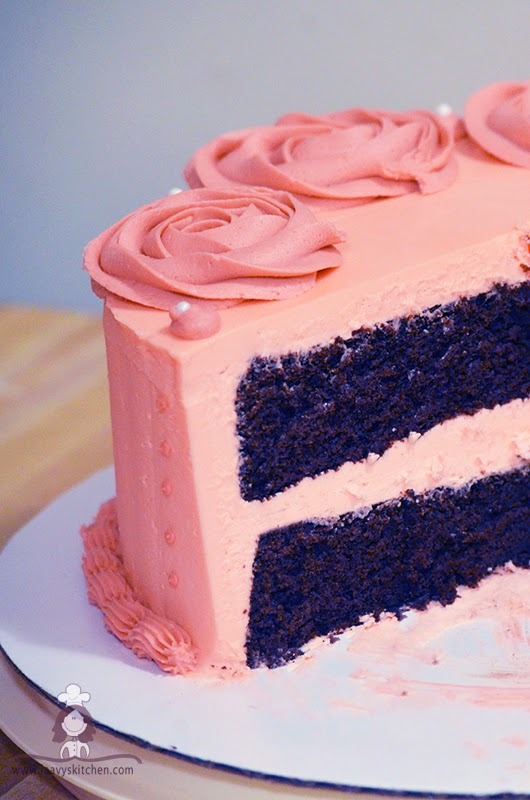 Take a fresh toothpick and just take a little food coloring and spread it along the icing.Add coloring in little amount until you get a nice pink color. Decorate your cake anyway you like. 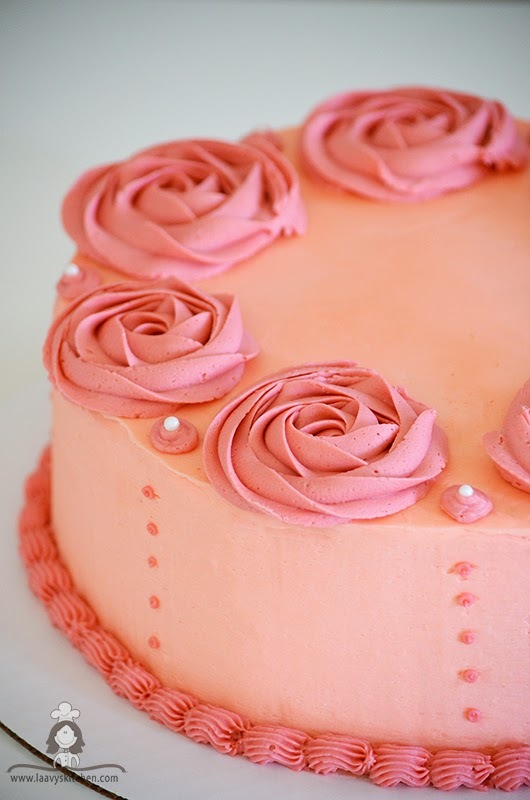 I used the following Wilton tips for decoration. Wilton Sugar Pearls for extra decoration around the roses. 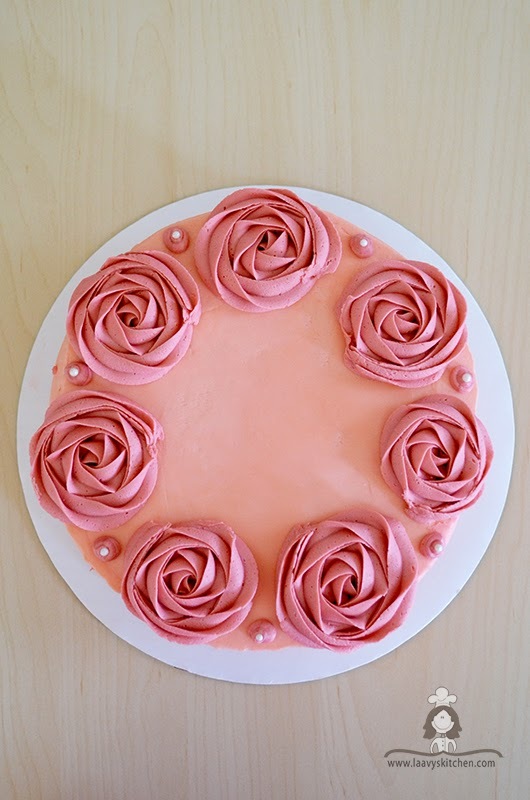 Few videos tutorials - Piping the roses and shells.Hope it helps out !! beautiful cake,loved the neat frosting n yummy slice too !! 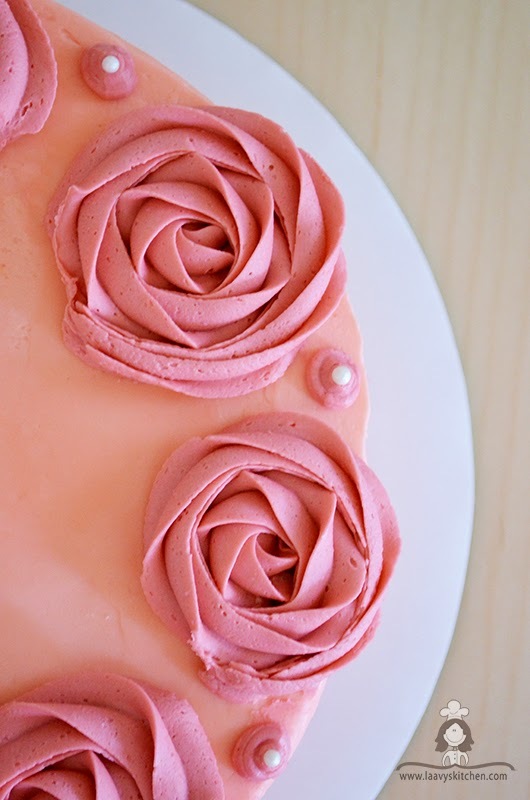 omg fabulous rosette and perfectly made butter cream dear :) wow wow ..